What Are Orchestral Musicians For? Years ago, before I was shown the door, I briefly taught at the Manhattan School of Music within their graduate program for aspirant orchestral musicians. My intention was to impart some knowledge about the history of the orchestra in order to shed light on the decline of orchestras and of orchestral performance – and to suggest that young musicians might be able contribute constructively. I boldly inflicted both reading and writing assignments. One day I brought my friend Larry Tamburri to address the class. At the time, he was CEO of the New Jersey Symphony Orchestra, where he had succeeded in creating a unique institutional culture. The NJSO musicians were partners. Some sat on the board. Some had artistic input. Astoundingly, Larry’s strategy enabled him to negotiate contracts with the players without the participation of attorneys. In my class, Larry drew two circles on the blackboard, a big one and a little one. The little one, he explained, signified the traditional institutional role of orchestral musicians. The big one showed what orchestral musicians needed to become: full institutional participants. Larry said that he was having trouble finding young big-circle instrumentalists for his orchestra. In my various orchestral adventures and misadventures, I had occasion to take part in the ritual of contract negotiations as CEO of the Brooklyn Philharmonic in the 1990s. I discovered that members of the orchestra with whom I thought I had a decent personal relationship became different people when seated on the opposite side of a table. A counter-example is the South Dakota Symphony, about which I have often written in this space. That is an orchestra full of big-circle musicians. 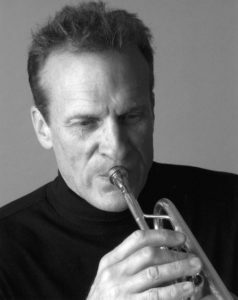 In PostClassical Ensemble – the renegade DC chamber orchestra I co-founded fifteen years ago with the conductor Angel Gil-Ordóñez – our big-circle contingent includes our principal trumpet, Chris Gekker. Now in a late phase of his career, Chris is one of the best-known brass players in the US. No other member of PCE is more keenly engaged by the intellectual content of our programing. Chris is also one of two PCE players who sits on our board of directors (the other being Bill Richards, our splendid principal percussionist). Chris’s big-circle attitude, I am certain, has something to do with a decision he made at the age of 25. Even though he had access to membership in major orchestras, he decided that he would pursue a different career trajectory and restrict his orchestral playing to part-time positions. So he became principal trumpet of both Orpheus and of the Orchestra of St. Luke’s in New York. He occasionally subbed as principal trumpet with the New York Philharmonic, or the San Francisco Symphony, or the Santa Fe Opera. And he simultaneously pursued a free-lance solo career including jazz and recording gigs. So he retained independence. Chris’s unusual qualities as a person correlate with his eclectic background. I also believe that his professional independence correlates with his unusual qualities as a trumpeter. His style of playing is utterly personal – but subtly so. The clarion swagger many associate with the trumpet is not for him. Rather, he has developed a lyric vein of his own. I cherish many memories of Chris Gekker in performance with PostClassical Ensemble – e.g., the cantabile solos in the second movements of both Gershwin’s Concerto in F and of Shostakovich’s Piano Concerto No. 1 (our soloist, Alexander Toradze, called Chris “free as a bird – he creates on the fly”). But mainly I remember his contribution to Silvestre Revueltas’s fabulous score for the film Redes – music we have both performed and recorded. With the Mexican bandas of his childhood always in his ear, Revueltas is a creative and demanding composer for brass. His tuba parts are unique. In Redes, he creates a work-out for solo trumpet that is grueling and rewarding in equal measure. Chris Gekker is also a teacher – and has been a member of the faculty of the School of Music at the University of Maryland (College Park) since 1998. I have no doubt that his special qualities as a person make him a special pedagogue. In fact, this past summer he became the first member of the School of Music faculty to be named a Distinguished University Professor. For a filmed interview with Chris Gekker, by PCE’s resident film-maker Behrouz Jamali, click here. Interesting article, but I do not think orchestras and orchestral playing are in any way “in decline “. In fact, standards of orchestral playing are higher than ever before , and there are more world class orchestras in America than ever before . The term “Big Five Orchestras ( New York Philharmonic, Boston Symphony, Chicago symphony, Cleveland orchestra , Philadelphia orchestra ) is now obsolete . There are many orchestras in America which are ion no way inferior to these . I agree with Robert – there is no decline. Quite the opposite – thanks to the many music schools and modern teaching methods, there is a surplus of superb players. Even our local amateur, semi-pro groups have benefitted and prospered thanks to so many highly skilled players being available but not quite good enough to get a prestigious job in major orchestra. On the other hand…I have noticed that many younger players have next to no connection to the repertoire. One of my bassoon teachers was blunt: if you want to play in an orchestra you have to get rid of the hip hop, rap, and other low value music you listen to and learn the extensive standard repertoire of orchestras everywhere. So I’m playing 2nd bassoon on Scheherazade and this new PhD in bassoon has never performed it, never heard it. I had to explain to her how those solos should be played, what they mean. Same with the Shostakovich 9th and much more. The kids can play all the difficult solo lit, all the monstrously complex etudes, etc, but their connection to the classical repertoire is niggardly. Taking off from AZ Cowboy’s comment, orchestral playing has gotten better and better technically–but stylistic differences from one orchestra to another, or the same orchestra playing different kinds of music, have pretty much disappeared. AZ Cowboy’s young bassoonist is typical of younger orchestral musicians these days: highly proficient technically, able to play just about anything with minimal rehearsal, but not acquainted with matters of style–the stylistic differences from one composer to another, but also the old national stylistic differences, as when you could tell a Russian (or French) orchestra by its brass, or a Czech (or French) orchestra by its oboes. The Philadelphia Orchestra was once defined by its lush strings, the Boston Symphony by its rich bottom end, the Chicago Symphony by its brass. So the decline is not in technique, but in style. If anything the technique of playing is far superior than it has ever been . What is in decline if not moribund is the orchestral players not understanding their “art” form ,its history and practice. I think someone may be pulling someone else’s leg, or perhaps someone is confusing Concerto in F with Rhapsody in Blue. According to all the sources I’ve seen, the Concerto was commissioned by Walter Damrosch for his NY Symphony Society after he heard the first performance of the Rhapsody, and Gershwin orchestrated it himself (for full orchestra — his first attempt at orchestration). Maybe someone arranged the Concerto for the forces of the Rhapsody’s original ensemble? Maybe so that the Whiteman band could play it, too?